For this round of Parties That Cook “Confessions” we bring you thoughts from one of our event servers. She reflects on the her first impression of PTC, as well as what she’s noticed since joining our team. When I first saw the posting that PTC was hiring event servers, I was intrigued. I immediately clicked through to the PTC website and found myself impressed by the concept. Guests work together, sharing ideas and contributing to one goal: making a fantastic meal. – PTC Founder and CEO, Bibby Gignilliat, is very involved in the company’s operations and direction. – The hard work and dedication of each member in the PTC family is apparent in the office and at every event. – Wonderful testimonials from the clients after events means we must be doing something right! I have loved being a server for Parties That Cook since October, 2013. With my corporate background, I especially love the idea of bringing colleagues together. Our guests may hold positions at different levels within an organization, and they may or may not work together on a daily basis, but coming to a Parties That Cook event, they will bond. 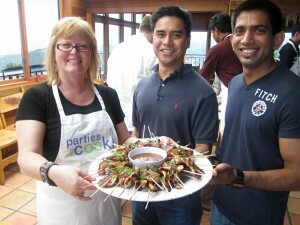 Hands-on cooking is an excellent corporate team building activity for any organization. 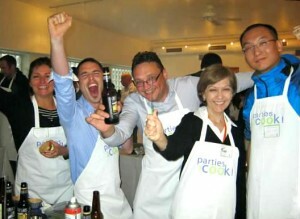 Connections made, bonds strengthened, and communication improved at a Parties That Cook event will carry over into the office.